Daytona Beach, Fla. (28 January 2016) – Shaking off the challenging weather conditions, Luis Bacardi’s Rum Bum Racing was right back up to its usual speed at its home track of Daytona International Speedway on Friday when Hugh Plumb put the No. 13 Rum Bum Racing Porsche 997 at the top of the time charts during a very rainy, wet IMSA Continental Tire SportsCar Challenge qualifying session on Thursday. His quickest time of 2:12.492-seconds was half of a second faster than the rest of the field. It marks Hugh’s second consecutive front row start at Daytona after he qualified second for Rum Bum Racing in last year’s race. 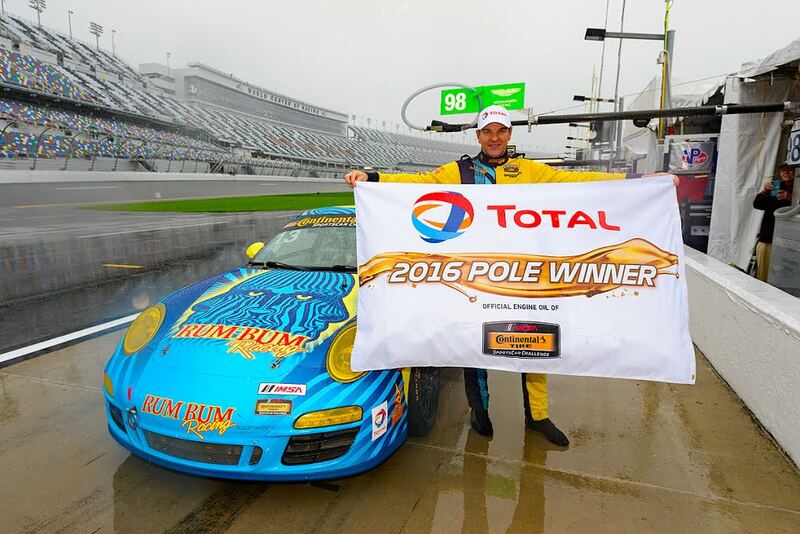 The run to the pole was all the more impressive for Hugh Plumb, who had never driven in the rain at the Daytona circuit prior to this year’s event. 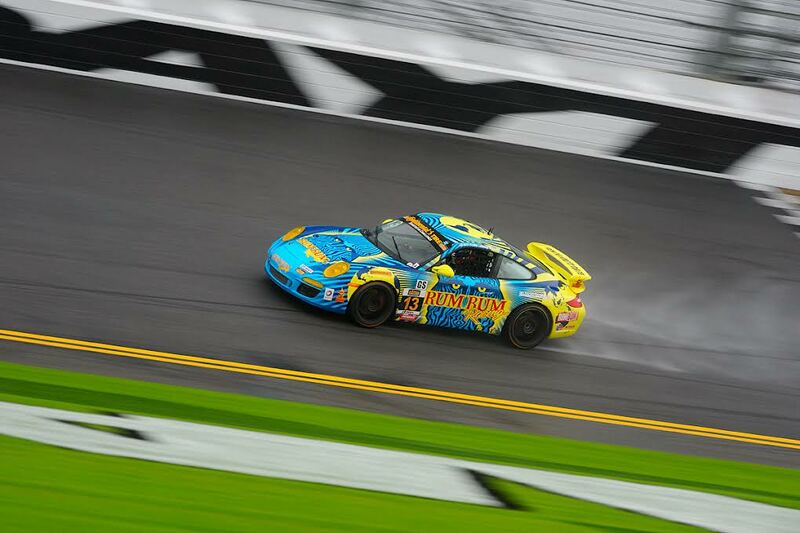 Rum Bum Racing also scored the pole at Daytona in 2011 and went on to lead 28 laps en route to victory. The Daytona weekend featured an abundance of rain with the 3.56-mile Florida road course providing for some slick driving conditions through two practice sessions on Wednesday and a third practice on Thursday. With the Continental Tire rains adding strength to the Porsche machine, Hugh and co-driver Matt Plumb posted quick times throughout each session. The brothers drove to the second quickest time in each of the three practice sessions. With the rain forecasted to move out and sunny skies predicted for Friday’s race, the event could well see very different racing conditions. Since debuting in 2010, Rum Bum Racing has taken home three victories, four podiums, and five top-five results at Daytona. On a track that often features late-race lead changes, Rum Bum Racing has shown strength from start to finish, having led laps in every race it has ever run at Daytona, for a total of 116 laps led and 31% of the time the car’s been competing on the Daytona circuit. The 2.5-hour BMW Performance 200 goes green at 1:45 PM ET on Friday. Watch the race LIVE on IMSA.com. FOX Sports 1 will televise the Daytona event on Saturday, February 13 at 8:30 AM ET. This entry was posted in News & Stuff and tagged bacardi, daytona, international, racing, rum bum, rumbum, speedway. Bookmark the permalink.